The outstanding Flicker Alley 5-disc set Georges Méliès: First Wizard of Cinema (1896-1913) is now published, and I have my copy. Naturally, it’s a sensational package. Put together by Eric Lange (Lobster Films) and David Shepard (Blackhawk Films) from the archival holdings from seventeen collections across eight countries, the elegantly-presented DVDs comprises 173 titles (including one unidentified fragment) – almost (though not quite) every extant Georges Méliès film, plus the Georges Franju 1953 film, Le Grand Méliès. The DVDs are region 0, NTSC format. The set comes with a well-illustrated booklet, which has essays by Norman McLaren (something of a surprise – it’s a transcript of an audio recording he made for a conference he couldn’t attend) and a long piece by John Frazer on Méliès’ life and work, adapted by Shepard from a text first written by Frazer in 1979. The full list of titles is now available on the Flicker Alley site, but here’s The Bioscope’s version, with the titles in the chronological order in which they appear on the DVDs, with Star-Film catalogue number, original French title and English title. 325-326 – Maison tranquille, la/What is Home Without the Boarder? 1066-1068 – Torches humaines/Justinian’s Human Toches 548 A.D. Almost needless to say, the quality of the digital transfers is excellent, sometimes startlingly so. There are fifteen examples of beautiful hand-colouring. 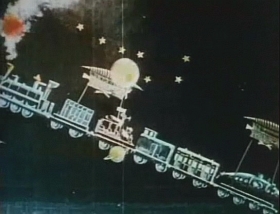 Many musicians have provided scores, making the DVD a fascinating demonstration in itself of different approaches to the task of accompanying Georges Méliès (even if, for myself I find the American taste for organ accompaniment baffling). They are Eric Beheim, Brian Benison, Frederick Hodges, Robert Israel, Neal Kurz, the Mont Alto Motion Picture Orchestra, Alexander Rannie, Joseph Rinaudo, Rodney Sauer and Donald Sosin. Some of the films come with Georges Méliès’ original English narrations, designed to be spoken alongside the films, and here are spoken by Serge Bromberg and Fabrice Zagury (with some rather quaint mangling of the English language in places). 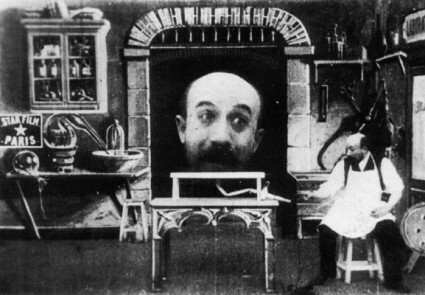 Georges Méliès is confirmed here as among the pre-eminent artists of the cinema, perhaps the most exuberant of all filmmakers. The films display imagination, wit, ingenuity, grace, style, fun, invention, mischief, intelligence, anarchy, innocence, vision, satire, panache, beauty and longing, the poetry of the absurd. 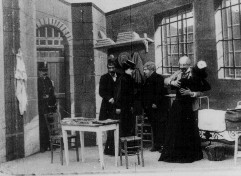 Starting out as extensions of the tricks that made up Méliès’ magic shows, to view them in chronological order as they are here is to see the cinema itself bursting out of its stage origins into a theatre of the mind, where anything becomes possible – a true voyage à travers l’impossible, to take the title of one of his best-known films. The best of them have not really dated at all, in that they have become timeless, and presumably (hopefully) always will be so. Méliès in his lifetime suffered the agony of seeing his style of filmming turn archaic as narrative style in the Griffith manner became dominant, but we can see now that is his work that has truly lasted. The films will always stand out as showing how motion pictures, when they first did appeared, in a profound sense captured the imagination. And there is that consistency of vision that confirms Méliès as a true artist with a body of work that belongs in a gallery – or in this case a boxed set of DVDs – for everyone to appreciate. What a great publication this is. Every good home should have one. 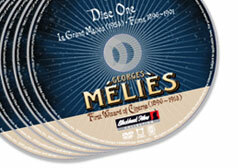 For information on a sixth, supplementary disc with an additional 26 titles, see https://bioscopic.wordpress.com/2010/01/08/melies-encore. Luke: This sounds wonderful. Something to save for. It’s certainly well worth forking out a little extra for such a deluxe and damn near comprehensive production. 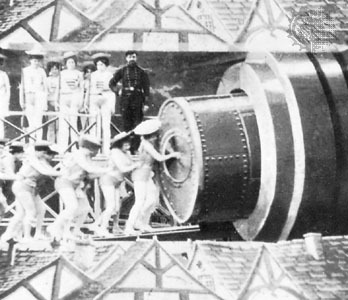 Rumour has it that the Méliès family is planning its own DVD production – no idea as yet how it will differ, nor which prints they will be using. Should be intriguing. Apologies for the shameless plug, but I started a blog three weeks ago with the aim of offering 500 word plus reviews of every film on Flicker Alley’s DVD – at the time of writing, it’s 21 down and 153 to go. Feel free to have a rummage on http://filmjournal.net/melies – and comments are most welcome. How amazing! I learnt about George Melieres in a fascinating book by Gaby Wood: Edison’s Eve: A Magical History of the Quest for Mechanical Life (Random House, 2002). She weaves a wonderful story from 18th century automata through Melieres and early cinema history to contemporary robotics. Thank you for the tip re Edison’s Eve, which I’d not come across before now. I’ll certainly check it out. Very late comment, I know. Followed through to this post from the Hugo Chabret review. Edison’s Eve was published in the UK under the title “Living Dolls”, and does indeed have a section on Melies. Brian Selznick cites it as the primary influence for his book. And yes, the Flicker Alley boxset is beautiful.